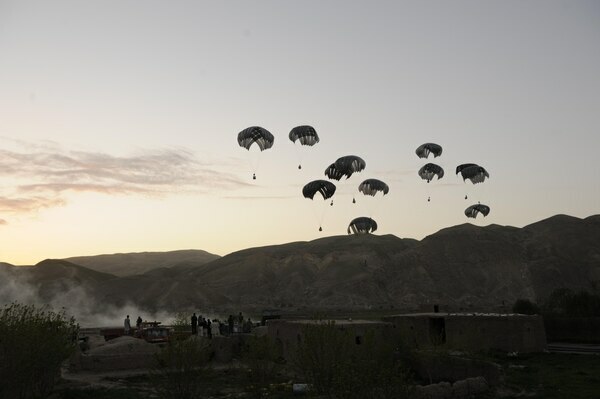 Airdrops in Afghanistan grew nearly ten-fold this year, as supplies were increasingly ferried out via cargo aircraft and parachuted into Afghanistan to sustain operations against the Taliban this spring and summer. More than 327,000 pounds of supplies were airdropped into Afghanistan by the end of May this year, with the bulk of those drops occurring in April and May, according to numbers provided by U.S. Air Forces Central Command’s Combined Air Operations Center. That number stands in stark contrast to 2017, when the Air Force dropped only about 33,000 pounds of supplies into Afghanistan throughout the year, but still far short of the nearly 11 million pounds dropped closer to the height of the war in 2013. Officially, the Air Force said the spike signals an increase in combat operations against insurgent forces. Unofficially, researchers have noted the rise in airdrops coincides with the arrival of a new unit to advise local forces and increased insurgent activity along major highways. “Airdrops have increased in Afghanistan in recent months as Afghan and U.S. ground forces intensified their operations against the Taliban in order to pressure the Taliban into reconciling with the Afghan government,” Capt. Mark Graff, an Air Forces Central Command spokesman, told Military Times. Graff could not expound on where the airdrops were focused, but did say supplies are not distributed evenly across the country. Some regions are receiving more attention than others. The vast majority of the airdrops took place in just two months. In April, American C-130s dumped 135,840 pounds of supplies to Afghan and U.S. ground forces. Then, in May, both C-130s and C-17s dropped another 191,400 pounds of supplies. “Also, for the calendar year thus far, mobility forces have delivered 47,832 short tons of cargo to bases in Afghanistan,” Graff said, referencing the more common resupply by runway of larger U.S. facilities, such as Bagram Air Base. The distinction is that airdrops are more often used to resupply or build up smaller and more remote outposts, which heavily dotted Afghanistan before the drawdown in 2014. While the airdrops are meant to “sustain operations,” they are not “speed-balls,” or ad hoc resupplies dropped to troops engaged in prolonged fighting and comprised mostly of ammunition and water, according to Graff. However, he couldn’t go into detail about the equipment that was dropped, whether the supplies are helping to build new U.S. outposts, or what exactly drove the change in the past two months. The C-17 Globemaster III has resumed combat-airdrops to remote bases in Afghanistan for the first time in roughly a year and a half. Bill Roggio, a senior fellow at the Foundation for the Defense of Democracies and editor of the Long War Journal, said the spike in airdrops could possibly be explained by an attempt to prevent Afghan checkpoints from falling based on local forces’ past complaints. “I can only speculate ... but every time Afghan bases or district centers get overrun, they’ll always say they weren’t getting food, they ran out of ammo, things of that nature,” Roggio said. Another possibility is that because the Taliban have been closing roads in the country, the airdrops have become a more efficient way to move supplies. The U.S. Army’s newly minted Security Force Assistance Brigade, or SFAB, could be another driving factor, as the airdrops roughly coincide with the unit’s arrival in March. The SFAB is now advising local forces at the kandak or battalion level throughout Afghanistan, according to Scott DesMarais, a research assistant on Afghanistan at the Institute for the Study of War. “I would guess that these resupplies are intended to support SFABs active around the country, but we’ve encountered very little information,” DesMarais said in an email. Still, insurgent activity near roadways has been noteworthy, he explained. Two airmen were awarded the oldest medal in U.S. military aviation history Friday for their actions in Afghanistan on Jan. 5, 2016, which left bullet holes in their aircraft’s rudder. “It’s probably worth mentioning that Taliban militants have been active along the main highways south of Kabul in Wardak, northern Ghazni, and southern Ghazni — near Paktika — during their 2018 offensive,“ DesMarais said. 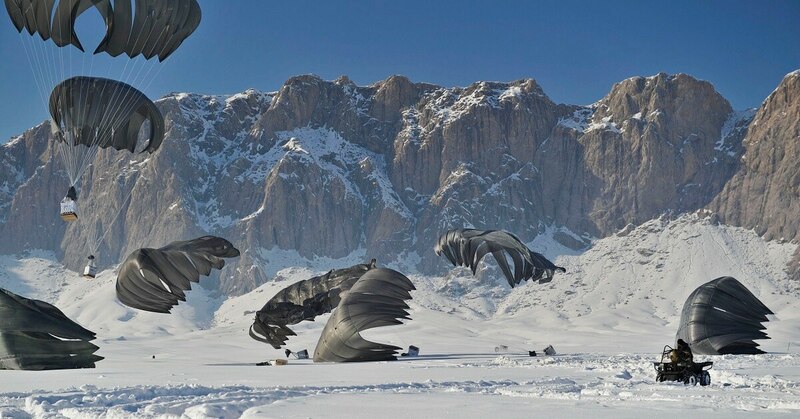 On behalf of Air Forces Central Command, Graff could only add that the airdrops are supporting both NATO’s Resolute Support mission to train, advise and assist Afghan forces, as well as the American-led offensive against insurgent forces, known as Operation Freedom’s Sentinel. As it stands, the United States maintains roughly 14,000 military personnel in Afghanistan for both missions, according to the Pentagon’s June report to Congress.